An Eastern Whip-poor-will was reported at 11:39 a.m. today roosting thirty feet high in a tree just north of the Gill and west of Azalea Pond. I arrived on the scene at 12:35 p.m. and saw two of Central Park’s top bird photographers with their cameras in place. The bird was resting on a mostly horizontal branch in full view, so it was easy to see the relevant markings. This is the second nightjar appearance of the year in Central Park — a Chuck-will’s-widow was seen by many in Tupelo Field on 16 May. The last noted appearance of an Eastern Whip-poor-will in the park was just over a year ago, 15 September 2012, at the very source of the Gill only a hundred yards away. At the very early hour of 5:50 a.m. on 9 September, a downtown birder observed a juvenile Virginia Rail in the Wall Street area near Maiden and William streets and later reported it on eBird. The observer was unable to re-find the bird after it flew off, so I did not expect to have any better luck trying at least several hours later, and so, did not pursue it. The incident did, however, start me thinking about Virginia Rails and about the Rallidae family of birds in general. One member of this family, the American Coot, appears regularly in Manhattan. American Coots can be seen every day on the Reservoir in Central Park during the cold months of the year. Most of the others are never noted in Manhattan except for the Sora and the Common Gallinule, which are reported at most a few times per decade. The last verified sighting of a Sora in Central Park was during 17-19 September 2011; and of a Common Gallinule, May 2010. So I was surprised when I received an email from Andrew Farnsworth late on the evening of 10 September asking if I had chased the Virginia Rail. 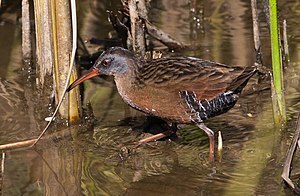 I initially figured he meant the one from the previous day seen downtown, but when I checked the rest of my inbox I saw an 11:28 p.m. eBirdsNYC report of a Virginia Rail in the Central Park Loch. I had missed the finder’s NYNYBIRD alert because my cell often does not receive texts in a timely manner when I am at home. But when I put together the timeline, I realized that I probably would not have been able to get the bird even if I had received the alert immediately. The lone observer noted seeing the Virginia Rail along the shore of the Loch in the Central Park North End between 5:15 and 5:30 p.m. and no more after that. The observer finished birding at 6:10, and did not send the NYNYBIRD text alert until 6:30. I have no idea why the lengthy delay. At any rate, some birders tried to re-find the bird the following morning without success. The Sora had remained for three days, so I knew there was some chance that the Virginia Rail would stick around, particularly since the winds were not favorable for migration and the bird had chosen a hospitable section of the park. At 5:23 p.m. that evening two North End birders alerted on NYNYBIRD that they were seeing the Virginia Rail. I was just on my way back from the gym, so I ran home, got my binoculars, and ran to the Loch, arriving at 5:40. After five minutes of waiting, the Rail popped out of cover and began walking along the shore and drinking from the stream. The bird appeared at least several more times on the evening of 11 September, giving close views (it did not seem to mind the presence of people) to all who went. It was my 229th lifetime Manhattan species.